González-Martín, S.; Juan, A.; Riera, D.; Caceres, J.
González-Martín, S. [et al.]. 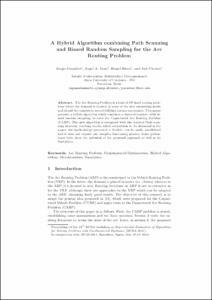 A hybrid algorithm combining path scanning and biased random sampling for the Arc Routing Problem. A: International Workshop on. "Proceedings of the 18th RCRA Workshop on". Barcelona: 2011, p. 46-54.